[By Nick] When Graeter's originally sent me free samples of their new products, somehow a couple of older pints slip into the shipment instead of all of the new flavors. One of which was Buckeye Blitz (aka Chocolate Peanut Butter Chips [aka my favorite ice cream]) and the other was this pint of Coconut Chocolate Chip. While I had no problem with seeing the former, the latter I was a bit hesitant about with my whole feelings towards coconut. 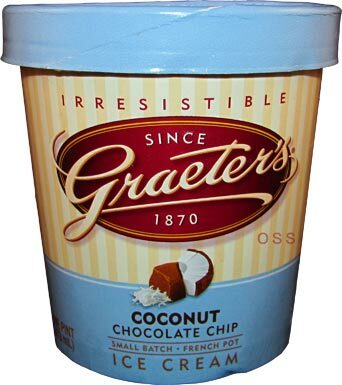 I have to say I've been liking it more and more as of late so if anyone can make a great coconut flavor, I'm sure Graeter's can pull it off. Ahhh, there's a decent sized chip trying to make itself noticed just under the top layer. Thankfully for me, that was one of the biggest chips I encountered in the whole pint, but I'll explain more on that in a second. The coconut base is actually really good. It has the tried and true Graeter's quality in texture. The coconut flavor, while a bit strong, isn't overpowering or artificial in anyway. It has the sweet, almost nutty quality to it that I've found in the other coconut flavors I've liked. There is one major problem though; Graeter's included the flesh of the coconut into this ice cream. As a refresher, there's nothing I hate textually more than shreds of coconut and their flavor is too much for me as well. That said, they weren't too much of a detractor for me. Remember how I said the chocolate chips weren't gigantic in my pint, we'll this worked out for the best. Their tiny-ness made them more frequent which helped to alleviate any of the terrible texture/flavor I was picking up from the shredded coconut. Their semi-sweet flavor was strong enough to mask that overbearingness that the shreds were adding to the pint. Once again, this is how flavors should work with one mix-in complimenting the next. That said, those pieces of coconut shreds knocked this one out of the running for my favorite coconut ice cream. Don't get me wrong, I still really enjoyed this and I'm sure others will feel the same. I just have resentment towards shredded coconut. If you like coconut and can tolerate the shreds, this one is definitely worth a try. Great review. I agree, I don't know why shreds are added to any coconut ice cream. It's funny, because to me, this is the best Graters Ice Cream flavor around. Anon #1, thank you and I think it's to add a ore natural vibe to the flavor. It's just not for me. Anon #2, I can see how you feel that way but even with my coconut biased nothing comes close to Buckeye Blitz for me. 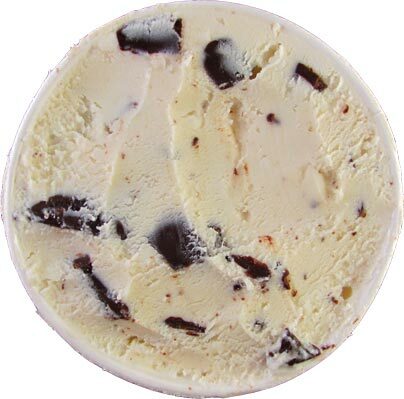 Graeter's Coconut Chocolate Chip ice cream is simply decadent! For those that love coconut it truly is the texture that makes it so special. 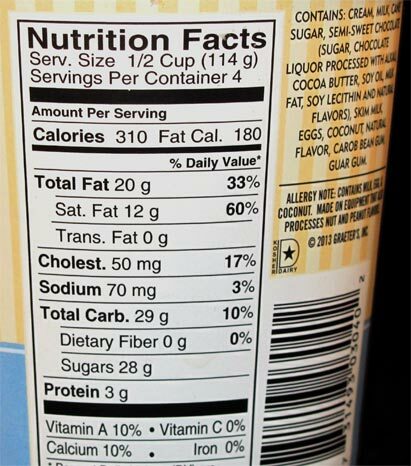 To name it "coconut" without this element would seem misleading and taste quite artificial. 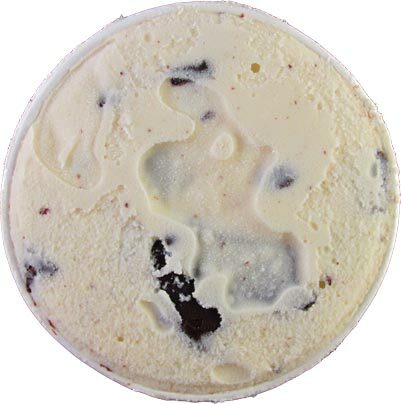 The combination of shredded coconut, chocolate chunks & cool creamy vanilla is amazing and well worth the premium price! EHMB, like I've said, I'm not a fan of coconut shreds but others might enjoy them. Though I've had flavors that didn't have it but taste very natural. That said, I'm not sure where you're getting vanilla from though since it's not included in the flavor. The base is actually coconut flavored and vanilla isn't even on the ingredient list. Absolutely hands-down the best flavor they make in my opinion. And I think I share that opinion with others because, although I can find all the other flavors, I haven't been able to find Coconut Chocolate Chip at any of the stores here in Tampa in months. When you can, it's typically $1.00 more than the other flavors, but well worth it.